The confusing-yet-brilliant inventor known only as Crazy Dave helps his niece, Patrice, and young adventurer Nate Timely fend off a “fun-dead” neighborhood invasion inPlants vs. Zombies: Lawnmageddon! Winner of over thirty “Game of the Year” awards, Plants vs. Zombies is now determined to shuffle onto all-ages bookshelves to tickle funny bones and thrill . . . brains. 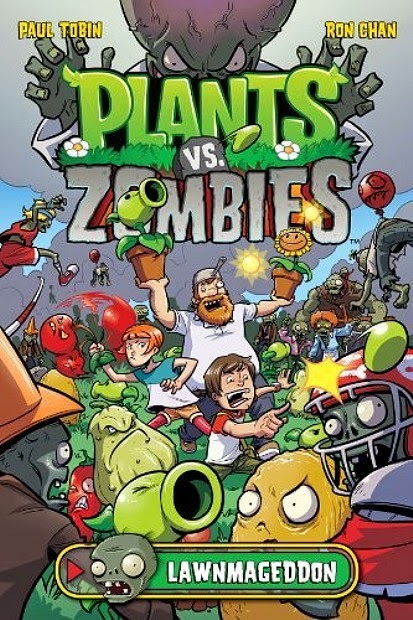 * The first Plants vs. Zombies comic book! * Collecting all Plants vs. Zombies digital comics into one nifty hardcover! * Tobin and Chan take us on an original Plants vs. Zombies adventure! When I had high blood pressure giving birth. I am deathly scared of snakes, and about 20 years ago I missed being bite by one by a smidgen. I can still feel that moment to this day. When my mom had a stroke and almost died. Doctors still don't really know how she survived it. When I first had to stay in a psych ward away from my family. That whole day was more terrifying than the reason for being institutionalized. When my dad's Guobon snake got loose in my bedroom. (Goubon's are from Brazil and their bite casuses you to bleed through every orrifice; you would bleed to death within an hour of being bit.) I could never go into my room again. When my 2 year old wandered off in the plaza. When my grandmother got seizure. When I went on the Behemoth at Canada's Wonderland. I am deathly afraid of plummeting to my death and frequently have nightmares over it. When I lost my last baby and almost died from internal bleeding. I have to say losing my mom in 2007 and then losing my dad last summer and knowing that I don't have any parents to turn to for advice and etc. My dad died in August 2011 and then my brother died that October. Then I had a baby in June 2012. I was a little nervous during the entire pregnancy because of the recent losses, and it was hard knowing they wouldn't be there to celebrate that special moment. When we were attacked by pirates when I was eight. I've had a couple. One that stands out more than most - I was a passenger in an RV that flipped as it was heading down the highway. i would say when i found out i had a blood clot.